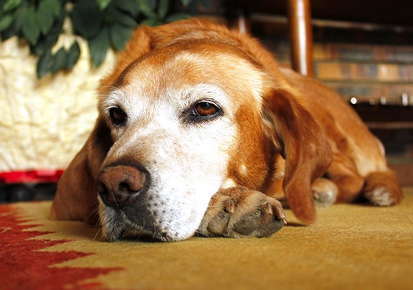 Vertigo is a syndrome in the elderly dog, which can be very frightening to the owners. The dog is suddenly afflicted with a balance problem, usually staggering, but occasionally unable to stand, and more rarely actually rolling over and over. There is a tilting of the head to one side and nystagmus, a rhythmic flicking movement of the eyes. Nausea and vomiting may also in present. It is not due to a stroke, as most people assume. It is thought to be due to an abnormal flow of fluid in the semi-circular canals of the inner ear. It is more common in older medium to large breeds of dogs. It is rarely seen in cats. Although the symptoms are alarming and often incapacitating to the dog, the prognosis is good. Improvement of clinical signs usually starts within 48-72 hours and most patients are normal within two to three weeks, even with no treatment. A mild head tilt may persist. Veterinarians should be consulted as the symptoms can also be caused by ear infections, foreign bodies in the ear, or tumors. The vestibular system may need treatment, with motion sickness drugs, or intravenous fluids if the nausea is severe or the dog is unable to eat or drink for a few days. New patients receive a free wellness exam. Visit our online pharmacy to conveniently shop for your pet! Time for a visit? We will do our best to accommodate your busy schedule. Schedule an appointment today! Going on a trip? We offer the convenience of scheduling your pet's boarding reservation online. Time for a refill? Request your pet's prescription refill online. "All staff caring and competent. We are thrilled with the care our dog gets here."